Vladimir Putin in Ashgabat. 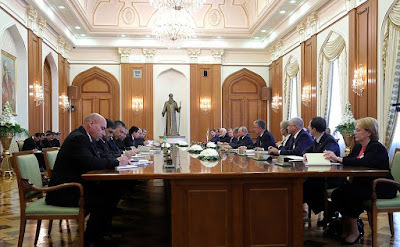 Russian-Turkmenistani talks. 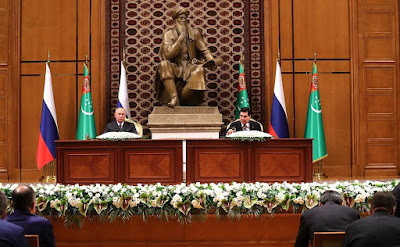 Putin.BLOG Foreign Policy Turkmenistan Vladimir Putin in Ashgabat. 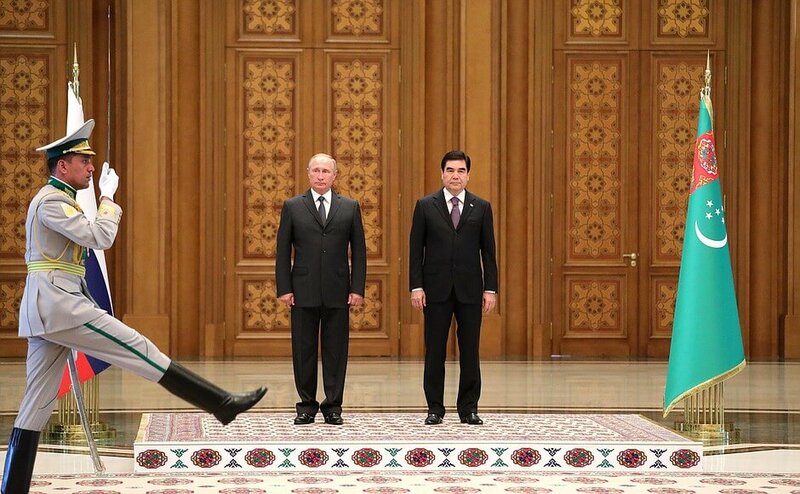 Russian-Turkmenistani talks. Ashgabat hosts talks between President of Russia Vladimir Putin and President of Turkmenistan Gurbanguly Berdimuhamedov. 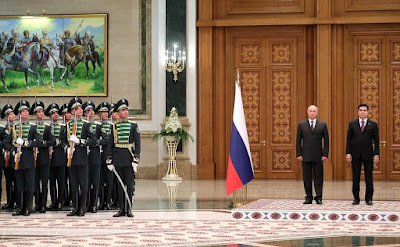 Vladimir Putin with President of Turkmenistan Gurbanguly Berdimuhamedov. 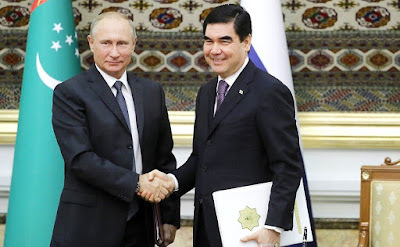 Vladimir Putin, Gurbanguly Berdimuhamedov and other participants in the limited attendance talks discussed current issues of relations between Russia and Turkmenistan. Following the talks, consultations were held with the participation of the delegations. 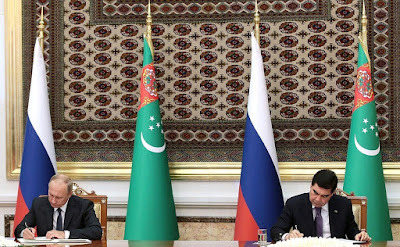 Following the talks, the two presidents signed the Joint Statement of the President of the Russian Federation and the President of Turkmenistan, as well as the Strategic Cooperation Treaty Between the Russian Federation and Turkmenistan. A package of intergovernmental and inter-agency cooperation documents was also signed. Intergovernmental agreements were signed on cooperation in combating illicit trafficking of narcotics, psychotropic substances and their precursors; on the mutual establishment of migration agency offices; and on cooperation in industry, agriculture, sport, tourism. A protocol amending the Intergovernmental Agreement on Marine Transport of September 17, 2013 was also signed. Vladimir Putin and Gurbanguly Berdimuhamedov signing documents following Russian - Turkmenistan talks in Ashgabat. In addition, inter-agency documents were signed regarding cooperation in finance, healthcare, culture, standardization and metrology. Vladimir Putin presented Gurbanguly Berdimuhamedov with a state award of the Russian Federation – the Order of Alexander Nevsky. 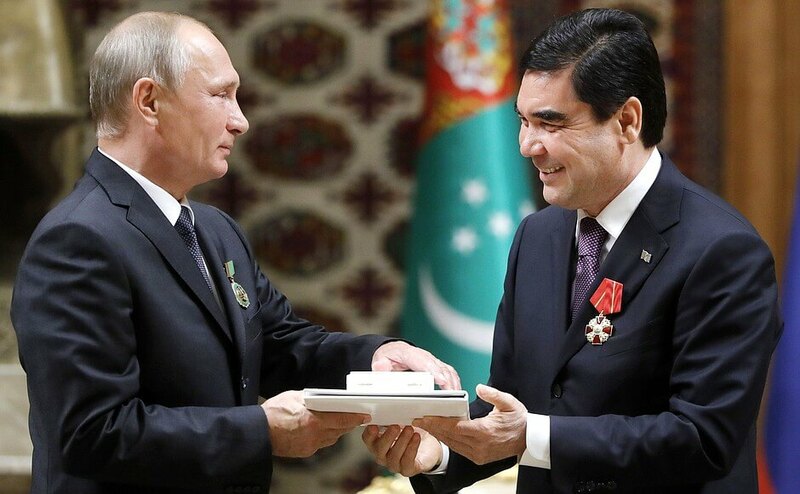 The President of Turkmenistan was recognized for his significant personal contribution to strengthening the strategic partnership between the two countries, and to stability and security in Central Asia. Vladimir Putin presented the President of Turkmenistan Gurbanguly Berdimuhamedov with a state award of the Russian Federation – the Order of Alexander Nevsky. 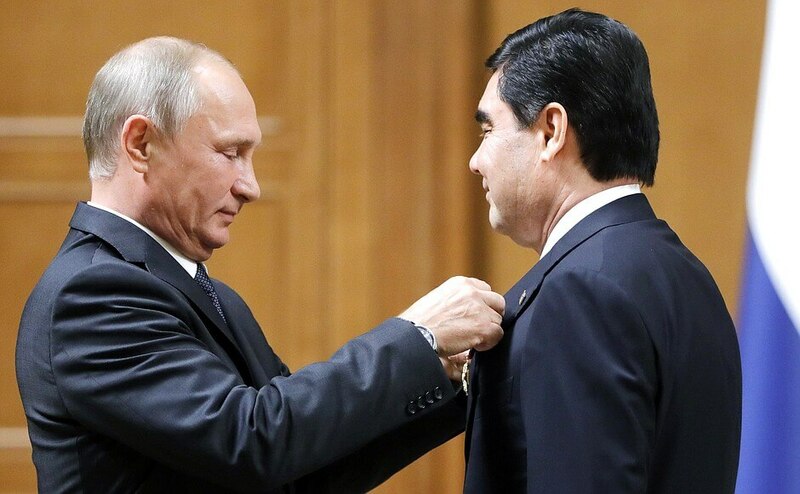 In turn, the President of Turkmenistan awarded Vladimir Putin the Order for Contributions to Developing Cooperation. 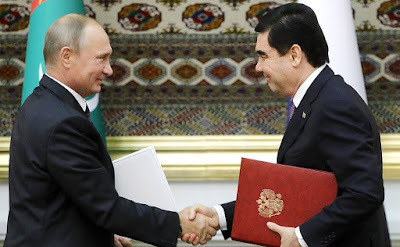 President of Turkmenistan Gurbanguly Berdimuhamedov presented Vladimir Putin with the Order for Contributions to Developing Cooperation. 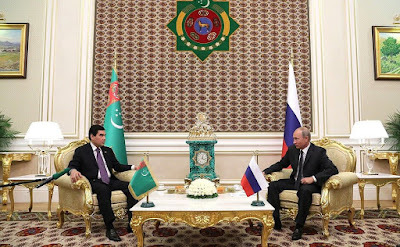 Vladimir Putin and President of Turkmenistan Gurbanguly Berdimuhamedov made press statements. 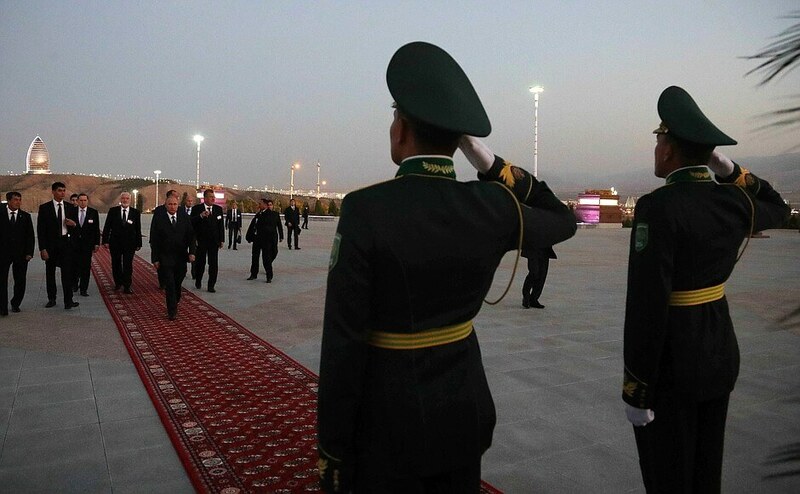 Later Vladimir Putin took part in a wreath-laying ceremony at the People’s Memory memorial in Ashgabat. 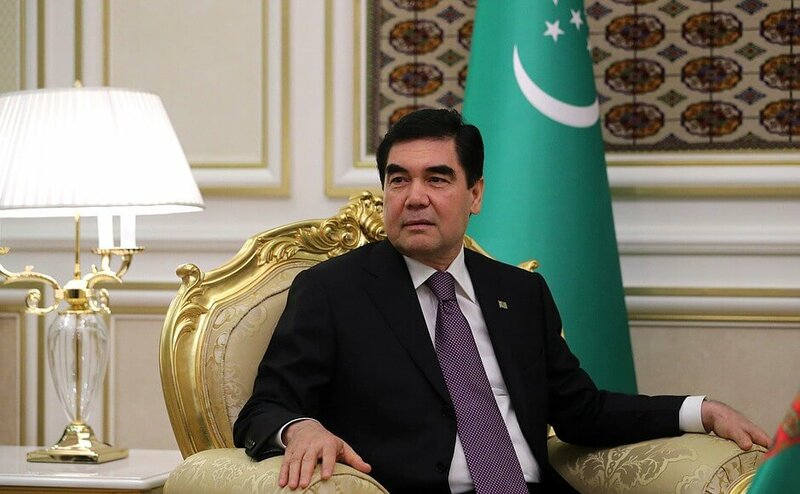 Beginning of meeting with President of Turkmenistan Gurbanguly Berdimuhamedov. Mr. Putin, please accept my heartfelt gratitude for accepting our invitation to make an official visit to hospitable Turkmenistan. We attach great importance to your visit, which is taking place in the year of the 25th anniversary of our diplomatic relations. President of Turkmenistan Gurbanguly Berdimuhamedov. Over this period, we have created a solid and strategic legal framework for cooperation. It is notable that we are cooperating now not only in the bilateral but also in the multilateral format in politics and on the international stage, as well as in trade, the economic, cultural and humanitarian spheres. We highly appreciate the potential of our cooperation. We are glad that we have strengthened the contact between our parliaments, because legislative matters are vitally important for us. 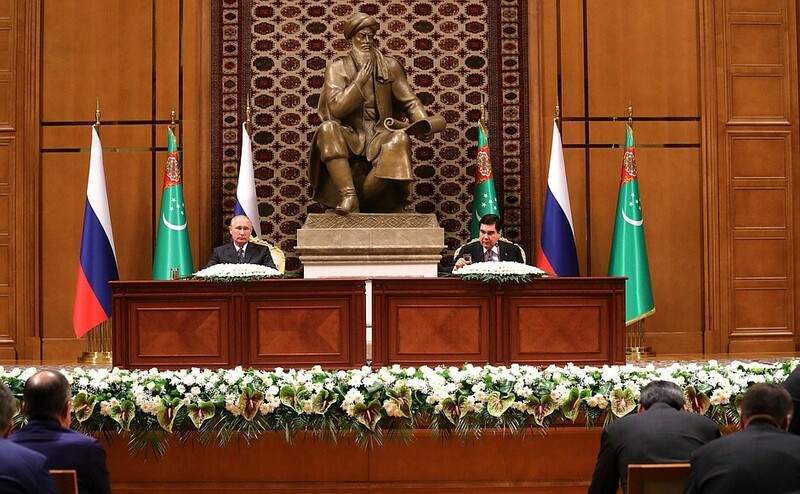 We view the further development of our capabilities in the interests of the peoples of Turkmenistan and the Russian Federation as a strategic priority. I would like to thank you for your personal contribution, for everything you are doing to strengthen the friendship between our nations and to wish you success and all the best to the great people of Russia whom you represent. We are happy to welcome you to Ashgabat. President of Russia Vladimir Putin and President of Turkmenistan Gurbanguly Berdimuhamedov. I am grateful to you for inviting me here. We agreed on this meeting long ago. We meet with you regularly. The last time we met was in Sochi nearly a year ago, and I hope we will meet again very soon at an event within the CIS framework. I fully agree with your assessment of our relations. But I would like to begin our conversation by congratulating you on the successful hosting of the Asian Indoor Games. It was a spectacular event. I know it took Ashgabat and the entire country six years to prepare for the games and they did a huge amount of work (we just discussed that with your colleagues), and most importantly everything that was built can continue to be used in the future. I know that you have plans to hold international events and competitions, and I am sure that the citizens of Turkmenistan will be able to use all this too. It was a major event and you did a great job, congratulations. As for bilateral relations, I think this meeting comes at a good time, because, unfortunately, due to a number of factors beyond our control, trade has declined somewhat, so we have to discuss what needs to be done to reverse the situation and develop our trade and economic relations so that they steadily improve as they have in years past. Once again, let me thank you for the invitation. I am sure our work together will be interesting and substantial. You mentioned sports. 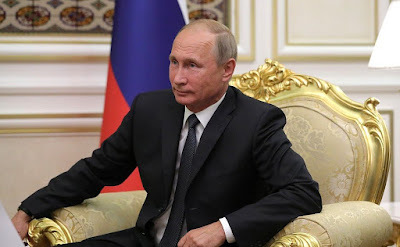 We essentially want to host international events together with Russia: plans call for hosting a weightlifting competition next year, then track cycling in 2019, swimming in 2020, and others. So, we are already discussing these sports. Thank you for the praise. The official meeting ceremony. 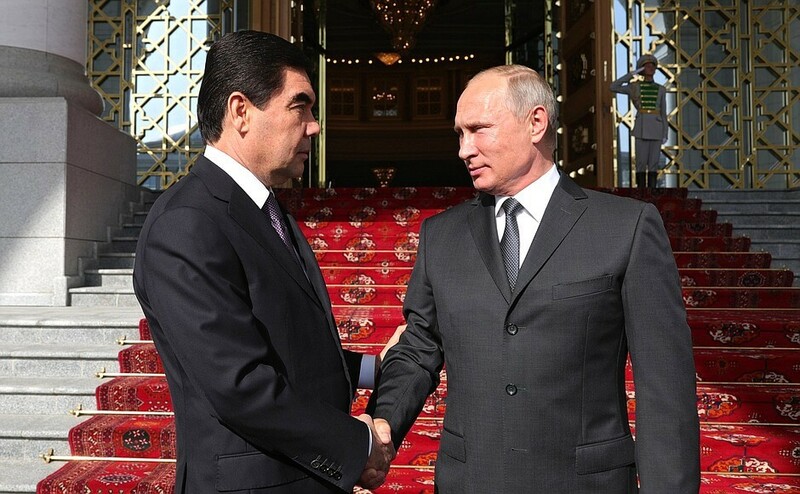 Vladimir Putin with President of Turkmenistan Gurbanguly Berdimuhamedov. 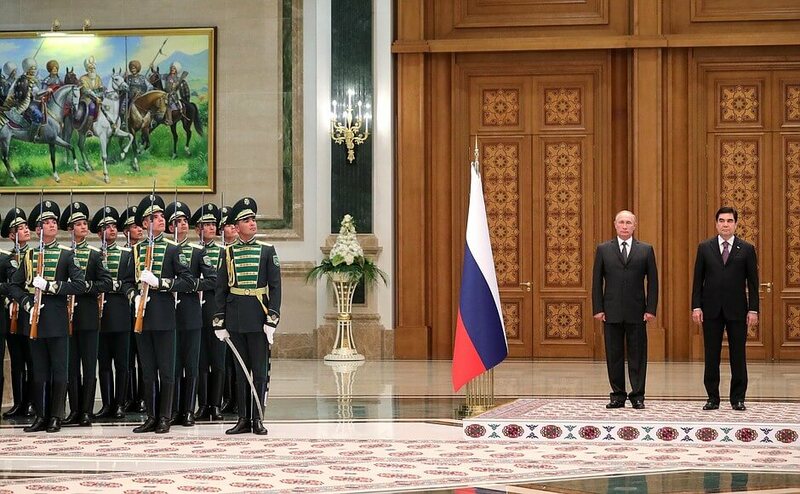 The official meeting ceremony of Vladimir Putin in Ashgabat. 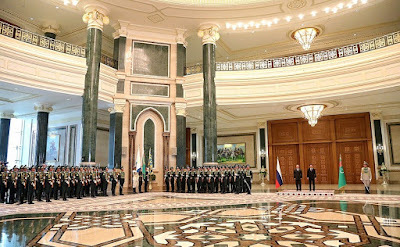 Vladimir Putin with President of Turkmenistan Gurbanguly Berdimuhamedov in Ashgabat. 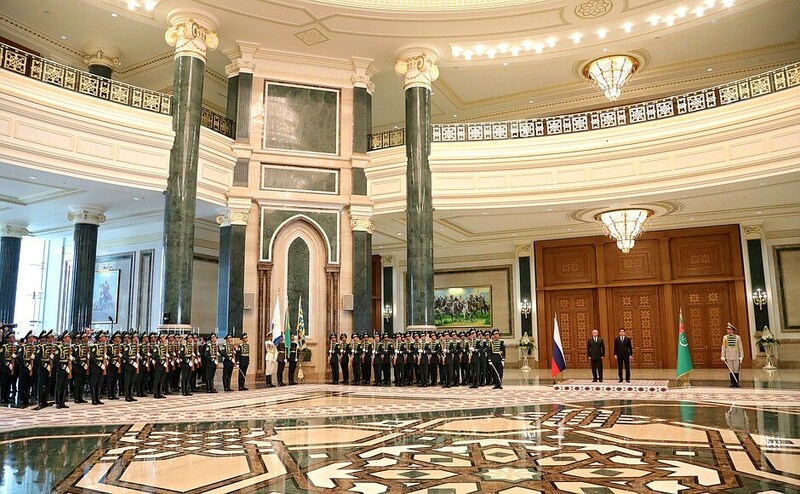 The official greetings ceremony of Russian President in Turkmenistan. 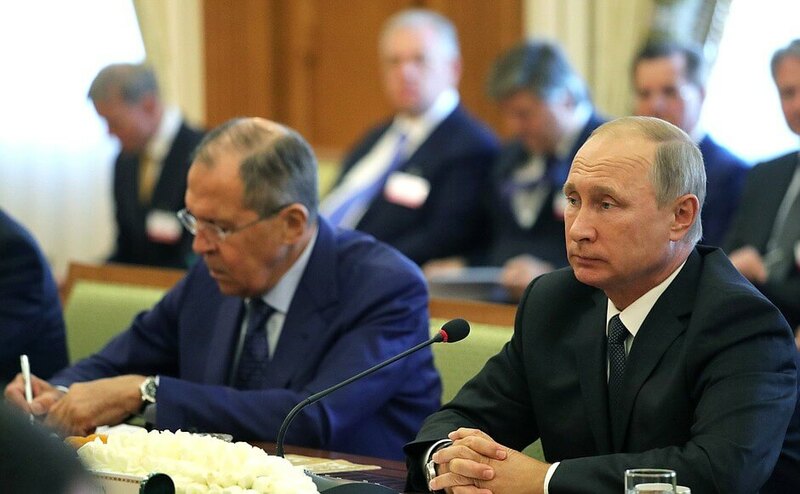 Vladimir Putin and Sergei Lavrov in Ashgabat, during Russian - Turkmenistani talks. 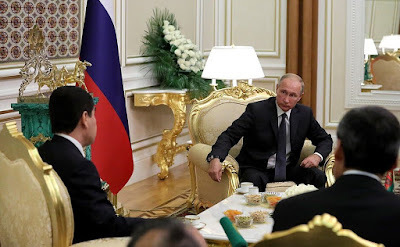 Vladimir Putin at a meeting with President of Turkmenistan Gurbanguly Berdimuhamedov. 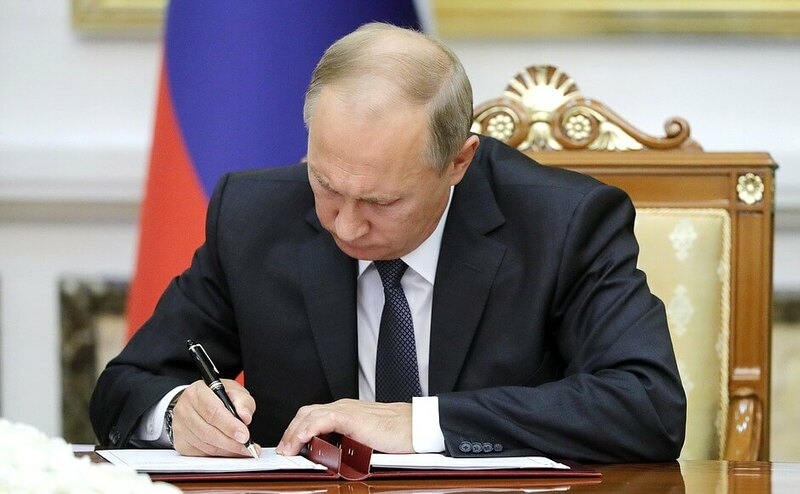 Vladimir Putin signing documents following Russian - Turkmenistani talks in Ashgabat. Vladimir Putin took part in a wreath-laying ceremony at the People’s Memory memorial in Turkmenistan. 0 Comment to "Vladimir Putin in Ashgabat. Russian-Turkmenistani talks."